Our partners over at the Belgium-based organisation Health for Animals have been highlighting the importance of immunisation recently under the theme of vaccines that are ‘changing the world’ to coincide with National Immunization Awareness Month – currently running in the US throughout August. Their recent blog post Five immunizations that are changing the world includes three livestock diseases that feature among GALVmed’s portfolio of development projects – Brucellosis, Peste de Petits Ruminants (PPR) and Porcine Cysticercosis (PC). Here at GALVmed, we work with our partners, including Health for Animals, to make livestock vaccines, medicines and diagnostics accessible and affordable to smallholder farmers in Africa and South Asia. To celebrate National Immunization Awareness Month and our partnership achievements in vaccine development we’re providing an update on where we are with our Brucellosis, PPR and PC projects. Creating a buzz in the veterinary press recently was the announcement of the first three prize winners each awarded US $100,000 following their initial application to the AgResults’ – a global US $30 million competition aimed at incentivising vaccine developers to develop an efficacious, safe and viable vaccine for use against Brucella melitensis in sheep and goats in the developing world. Brucellosis is a costly disease that affects ruminants – cattle, sheep, goats, buffalo, etc. – and causes abortions, infertility, decreased milk production and weight loss, amongst other effects. It is endemic in a number of developing countries, and the toll on smallholder farmers in South Asia and sub-Saharan Africa is particularly devastating, since cattle and small ruminants, such as goats and sheep, are a crucial source of income. The annual impact of Brucellosis to smallholders across sub-Saharan Africa and South Asia is estimated at USD $500 million per year. 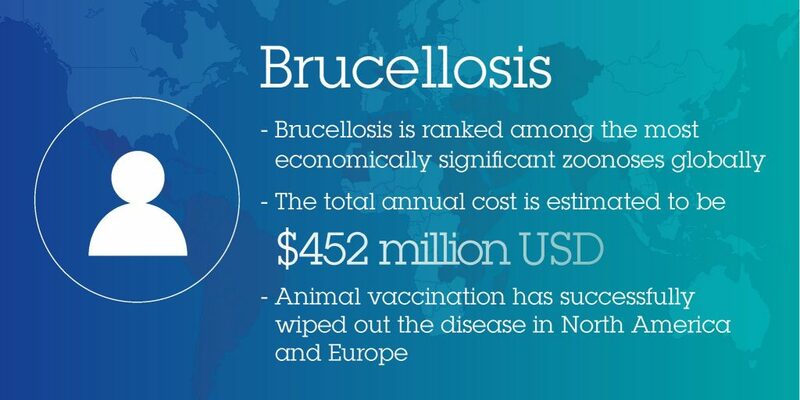 Brucellosis is also the most common type of disease that is transmitted from animals to humans, with approximately 500,000 new human cases reported each year. The Brucellosis Vaccine Prize is designed, funded and managed by AgResults – a collaborative initiative between the governments of Australia, Canada, the United Kingdom and the United States as well as the Bill & Melinda Gates Foundation. It invites vaccine developers to submit their proposals for the development (and ultimately registration) of a suitable vaccine that is efficacious, safe and viable for use against Brucella melitensis in small ruminants across the developing world. Implemented by the Global Alliance for Livestock Veterinary Medicines (GALVmed), the competition involves three phases and can run for up to 10 years. Read about the first set of prize winners and more about the Brucellosis Vaccine Prize, which is accepting applicants to Phase 1 until 18 November 2017. Also of great economic significance to smallholder farmers is the viral small ruminants disease Peste des Petits Ruminants (PPR), which is estimated to cost US $874 million per annum. GALVmed’s objectives in tackling PPR include assisting in wider registration in Africa of a PPR vaccine, completing vaccine thermotolerance work and developing a multivalent vaccine potentially covering PPR and other diseases of small ruminants such as Sheep and Goat Pox (SGP) and Rift Valley Fever. In 2016 GALVmed supported MCI Santé Animale, a Morocco-based animal health company, to test the field acceptance of a combined PPR/SGP vaccine. The combined vaccine has been named LYOPOX-PPR®. The test was carried out in three African countries – Mali, Tanzania and Uganda – and also involved deworming of sheep and goats. A similar test is being carried out in Kenya on a commercial basis to gauge its acceptance with the livestock-keeping community. Traditionally, governments provide vaccines during outbreaks to prevent spread of the two diseases. By combining the two vaccines into one, the livestock keeper will have a tool to control the two diseases in one move. By the time a disease outbreak is apparent, it is usually too late for the affected community. A key breakthrough in tackling Porcine Cysticercosis (PC) came last year with the announcement of the first-ever licensed vaccine for the disease developed by Professor Marshall Lightowlers at the University of Melbourne. PC is a neglected disease caused by the parasitic worm Taenia solium in pigs. 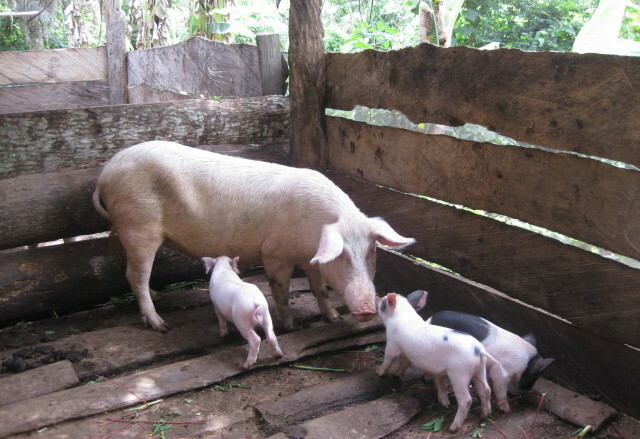 It is most commonly found in Latin America, Southeast Asia and Africa and is most prevalent in rural areas where pigs are allowed to roam freely. Humans can be infected when they accidentally ingest infected pork (which leads to an intestinal infection) or infective eggs, which leads to neurocysticercosis, an infection of the nervous system that causes epilepsy and is the main cause of acquired epilepsy in the developing world. The disease is a serious public health and agricultural problem and causes around five million human cases and 50,000 human deaths each year. Following the announcement, Professor Lightowlers said: “The publication of results from a trial undertaken to eliminate Taenia solium transmission from the Tumbes region of northern Peru represents an important step in the prevention of epilepsy caused by parasitic infections. “The contribution of the TSOL18 vaccine for pigs was found to be critical to achieving the highest level of disease control. The TSOL18 vaccine technology, known as Cysvax®, is on sale in India through is the first step towards expansion of the vaccine licensing in other countries as licensing in the country of manufacture is typically a prerequisite to other country licences. GALVmed is also working with partners in Uganda, Tanzania, Zambia, Nepal and India in pilot projects in PC vaccination and deworming to raise awareness of the disease and the vaccine. Commenting on GALVmed’s work on the field of immunisation, Health For Animals Executive Director Carel du Marchie Sarvaas said: ““It has been incredibly encouraging to witness GALVmed’s progress in recent years. Diseases like Brucellosis are often forgotten in regions where it has been controlled, while it remains endemic and devastating across South Asia and sub-Saharan Africa. “GALVmed is filling an important void in encouraging the development of new tools that we can use to fight these diseases that will save not only the lives of animals, but humans as well. We will continue to update you on these and other projects. Check our blog regularly or sign up to our bimonthly newsletter at the bottom of the home page. and the wellbeing of their families. out by three separate associations in Lilongwe, Phalombe and Zomba. 500-1,000 chickens and more – but such large dose packages are ill-suited to backyard poultry keepers with five to ten chickens. Other factors which have contributed to poor access of the ND vaccine include: a lack of awareness of the value of vaccination among farmers, limited access to suitable agrovet shops, and lack of electricity in rural areas to power refrigerators that are necessary to keep vaccines viable. Awareness of the thermotolerant I-2 vaccine, produced in smaller doses by the Central Veterinary Laboratory (CVL) in Lilongwe, has increased through campaigns supported by the GALVmed/Inter Aide partnership. The financial support from GALVmed has also made it possible to extend ND vaccination services to many rural communities. Graça Archer, Programme Officer for Inter Aide’s ND Control Programme, says each campaign is methodical and runs for four months. “During the first month, community vaccinators go door to door to carry out poultry registration. This includes recording the number of chickens for vaccination and how many vials are needed per house. The second and third months are for the actual vaccination of the chickens, and the fourth month is for review of the successes and challenges,” Archer explains. She adds that the peak of the campaign takes place in July, shortly after the harvest season, when farmers have more money to buy and sell chickens. The exchange of chickens during this time increases the risk of transmitting the ND infection, and is also the time when ND outbreak is at its highest. “Acceptance of the vaccine in July is high. For instance, last year we vaccinated 590,800 chickens during this month,” says Archer. Eveless Makalani from Lumbwe village in Kalumbu, Lilongwe district, is a poultry farmer with 51 chickens and has worked with the community vaccinators for almost a year. She became aware of NCVA’s work through farmer-to-farmer extension meetings held during chicken vaccinations. Prior to vaccinating her flock, Malakani says she sold her chickens at a maximum price of 2,000 Malawian Kwacha (MK) (US $2.70). Now, one of her vaccinated chickens sells for MK 3,500 (US $4.80), which covers the cost of the I-2 ND vaccination for over 50 birds. She adds that the affordability of the vaccine helps to make chicken rearing a viable business in the region. Through the sale of her chickens, Makalani is able to afford farm inputs such as fertilisers and farm implements such as hoes. Lydia Katengeza is an NCVA member from Chizinga village in Lilongwe district. Katengeza administers the vaccine at a cost of MK 70 (US $0.01) per chicken. “We were first trained as field facilitators in 2014 under a CARE Malawi programme. Then CARE linked us with Inter Aide who trained us on the procedures of how to become community vaccinators,” says Katengeza. She added that the knowledge and procedures she has learnt from the Inter Aide training, such as rural business management, have also been of great benefit to her as a poultry farmer. Her chickens no longer die of ND and she has also managed to help her neighbours overcome the disease. “I have been able to afford 10 goats and to build a good house through my earnings as a vaccinator. I am also able to pay school fees for my children. 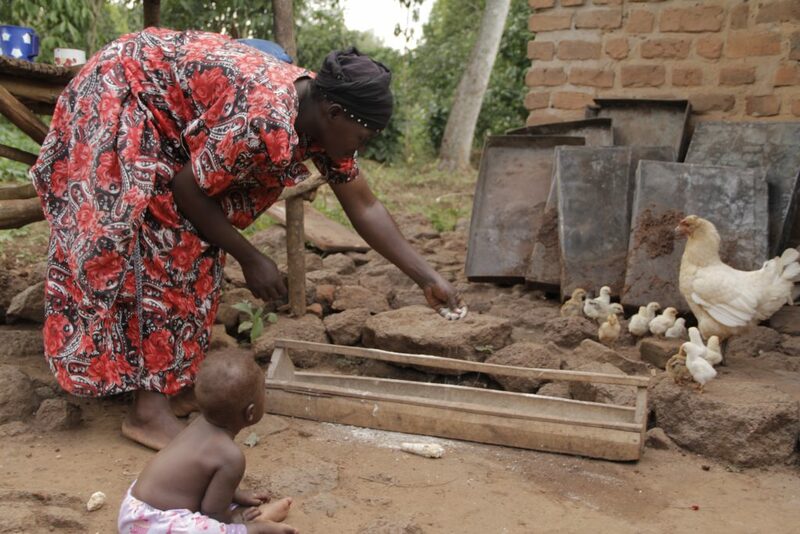 As a family, we have increased our protein intake due to the improved health of our chickens,” says Katengeza. Another vaccinator, Yolomosi Tifere from Lumwe village in Mazengera area, has managed to build three houses from the proceeds of his vaccination work. “From every vaccine vial of 300 doses I administer, I make a profit of MK 5,100 (US $7). In one month when there is a good response from farmers to have their chickens vaccinated, I am able to finish close to 15 bottles of the I-2 vaccine. This translates to a revenue amounting MK 76,500 (US $105),” says Tifere. household incomes, child nutrition and education, and employment generation in rural areas. However, there are also challenges. Demand for the ND vaccine is growing and the production capacity of CVL to meet local demand is limited. Options to mitigate this supply gap include investment in the equipment and capacity of CVL to increase production, and/or strategically open up the market and allow ND vaccine importation. Making livestock vaccines and medicines easily accessible to smallholder farmers is a vital component of the value chain. If the vaccines are beyond reach, the farmers will not benefit and their livestock will suffer. 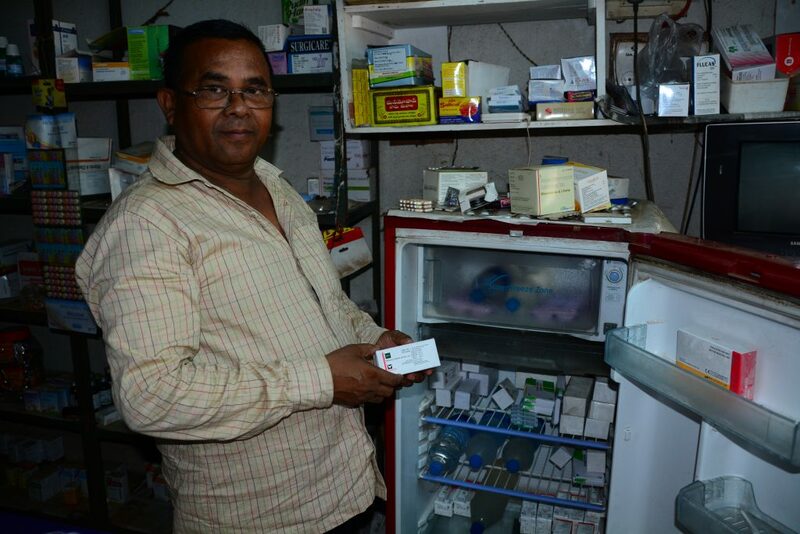 In Mayurbhanj district of Odisha, India, local retail shops provide the much needed solution to a glaring gap by stocking and making readily available, essential livestock vaccines and medicines such as the Newcastle Disease (ND) vaccine. Often, they are regular medicine shop owners, who are now finding that stocking vaccines such as the ND vaccine profitable. Furthermore, these retail shops have the required equipment and knowledge such as cold chain storage management to ensure that the quality of the vaccines are not compromised. Access to the vaccine and the build-up of new and more efficient commercial supply chains have been facilitated by the Bhodal Milk Producers Cooperative Society (BMPCS), a local NGO in partnership with the non-profit Global Alliance for Livestock Veterinary Medicines (GALVmed). In the initial days of the project, there were no retailers below the district level who kept and sold the ND vaccine. As a solution BMPCS tried to work with a few vaccinators who could reach the remotest parts of the district. Sanatan Soren, 32, a vaccinator from Khanda Hari Village, Block Ras Gobindpur comes from a family of farmers. In 2011, BMPCS gave Sanatan and four other vaccinators from the nearby villages a small refrigerator to store vaccines. This setup or “Vaccination Centre” was one of eight centres that were established in order to streamline the distribution of vaccines in the region. Each vaccination centre would cater for between four and six vaccinators, who would collectively pay Indian rupees 300 (US $ 4.64) to offset the electricity bill (cost) for the refrigerator. However this approach had some drawbacks. First came the problem of irregular power supply. In the forested parts of Odisha, the period from December to February is locally known as ‘Elephant season’. During this period the government cuts off day-time electricity power supply in entire areas to prevent elephants being electrocuted. This meant that many of the vaccines would be rendered non-potent and cannot be administered. What’s worse is that the Elephant season coincides with outbreaks of Newcastle Disease. Another obstacle that the vaccination centres encountered was to do with licensing. The distribution of vaccines requires a license from relevant authorities. Most of the vaccination centres did not have formal licenses to operate rendering them technically illegal. This hampered any promotion of the operation and consequently the expansion of the project as most vaccinators would not know of the existence of the centres. Also the entire income was dependent on the sale of a single vaccine and de-wormer unlike the medicine shops where a range of products are sold and small profits from the sale of each product are used to meet the operational costs. In 2012, BMPCS started to partner with local chemists to stock the ND vaccine. The chemists sold the vaccines at affordable prices to farmers and the results were incredible. Trilochan Dhal, 48, runs the Jai Guru Dev Medical Store in Kosta, Suryapada a few kilometers away from the district headquarters of Baripada. He has been selling the vaccine for a few years now. He buys each vial at Indian Rupees 18 (US $ 0.03) and sells them at Indian Rupees 22 (US $ 0.35). He sells about 500 vials a month, earning a net profit of about Indian Rupees 2,000 (US $32). It’s a modest amount but it contributes to offsetting some of his monthly expenditure. Initially Trilochan served only a few vaccinators but as word spread, his customers increased in number. Today he caters for some 40-50 vaccinators from the neighbouring villages and occasionally a few farmers. “I see the demand increasing further in the times to come,” he beams when asked about the prospects. Piyush Mishra, the Program Manager for BMPCS states “The regular awareness programmes helped in growing the demand while lower cost of the vaccine and easy availability further boosted sales”. This approach has yielded positive results. In Mayurbhanj, the number of retailers of the ND vaccine has gone up from six in 2012 to 27 in 2017. The total doses of vaccine sold has also gone up from about 50,000 in the same period to between 250,000 and 300,000 currently. Building sustainable vaccine retail chains has been a vital part of providing farmers with much needed services. The market continues to grow as retail shops earn profits from the sales. Many of the retailers also double as vaccinators. This points to a healthy demand for the ND vaccine and a sustainable marketplace. 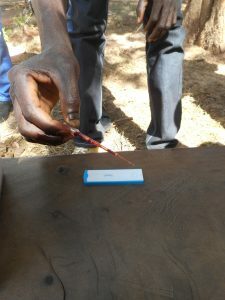 A simple diagnostic device is enabling farmers in Cameroon to test for the deadly livestock disease Animal African Trypanosomiasis (AAT or Tryps). AAT is caused mainly by two parasite species, Trypanosoma vivax and Trypanosoma congolense, which affect cattle in much of sub-Saharan Africa. However, according to veterinary experts, a new rapid field test can identify whether or not an animal is infected with the T. congolense or T. vivax strain through a single drop of blood, reducing the occurrence of misdiagnosis and helping farmers avoid costly expenditure on unsuitable treatments. Prior to the test, animals were only treated for AAT after showing vague clinical signs of the disease, which can be easily confused with other common problems such as tick-borne diseases, and often result in the use of the wrong product for the wrong disease. However, due to the test’s quick results, farmers do not need to wait for the appearance of clinical signs before treating the animal. AAT is a major limiting factor in the development of animal production in Cameroon – as it is throughout the rest of sub-Saharan Africa. The disease is endemic in 40 African countries and accounts for up to a 50 per cent loss in milk and meat production on the continent. According to the Food and Agriculture Organization of the United Nations, losses associated with the disease in Africa are estimated at between US $1 and 5 billion annually. Clinical signs for AAT include weakness, lethargy, anaemia and fever, which lead to weight loss as well as fertility and milk reduction. However, symptoms alone do not allow for an accurate diagnosis, and diagnostics for AAT parasites are limited or may not produce accurate results. To address this issue, the Global Alliance for Livestock Veterinary Medicines (GALVmed) – a non-profit company that makes livestock vaccines accessible and affordable to smallholder farmers in Africa and South Asia – has worked with Ceva, the University of Bordeaux, the French research agency CIRAD and teams of researchers throughout East, West and Southern Africa to develop the first available rapid field diagnostic test against animal trypanosomosis in the world. 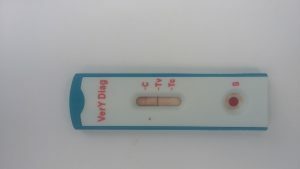 This test, called VerY Diag, is able to quickly detect infection with the T. congolense and T. vivax strains. GALVmed’s partner, major international animal health company Ceva, is now leading the initiative to increase the availability and reach of VerY Diag, which is now used in the Littoral, West, Northwest and Northern regions of Cameroon. “The test now allows millions of smallholder cattle farmers an efficient way to test their cattle and provide the right cure,” says country representative, Dr Fidele Marcel Abena of Ceva Animal Health. The affordable device, does not require electricity or any additional equipment, making its deployment in resource-limited settings very practical. Many farmers attest to the rapid field test’s ease of use and effectiveness in protecting cattle health. 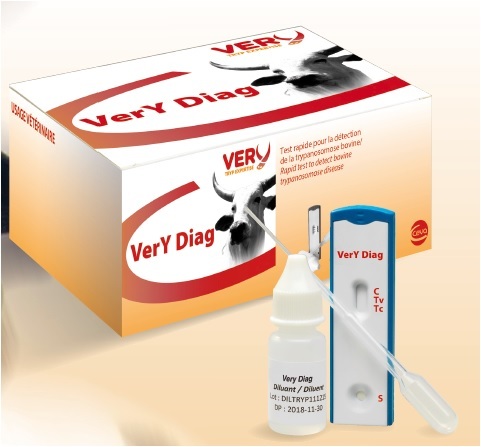 Since the launch of the diagnostic in October 2016 by Ceva, farmers have been able to identify the right treatment for their cattle. As a result, cattle are producing more milk and achieving higher market prices. 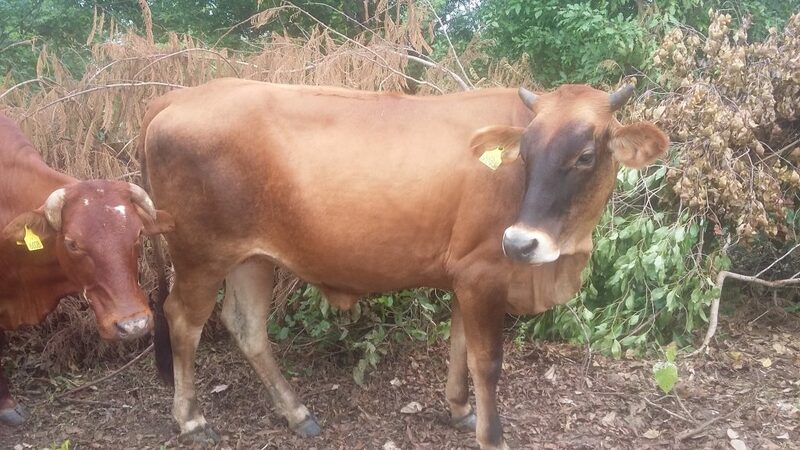 “Before, most of my cows did not look healthy, weighing below 250 kg and forcing me to sell them at the give-away price of less than 200,000 fcfa (US $340) but now I am proud to see my cows weighing over 300 kg and selling at 300,000-400,000 fcfa (US $500-680),” says Amadou Djibrilla, a farmer from Ngaoundere in the Adamawa Region of Cameroon. “This innovation has given farmers a plus, it is like health security for our cattle,” says Aboubakary Hamadou, a cattle farmer also from Ngaoundere. In 2012, Hamadou lost over 50 cows and another 26 in 2015 due to misdiagnosis and ineffective treatment of AAT. Since utilising the test prior to applying treatment, he has not lost a single animal. “It is a great relief for us that diagnostics now exist for farmers to test their cattle prior to applying medicines, helping us to avoid unnecessary financial waste and better protect our resources,” says Abbo Mohamadou, a cattle farmer of Ngaoundaba Ranch located 35 km from Ngaoundere. “Without the test, we used to incur great financial losses but now the situation has significantly improved,” states Mohamadou. As the VerY Diag test uses antibody detection technology to enhance test ‘sensitivity’ (the ability to identify infected individuals correctly) and reduce false negative results, the test is able to detect the presence of antibodies within a few days of infection. According to Dr Ibrahima Djibo, a support staff member at Ceva’s Cameroon office, “The test process is simple – taking a drop of blood and mixing it with a drop of reagent on the device. The red blood cells from the samples will be trapped by some of the test elements. If animals are infected, antibodies against the Trypanosome parasite will trap the parasite in the test at the ‘Tv’ or ‘Tc’ line. This will lead to the appearance of a red band (indicating a T. vivax or T. congolense infection). If animals are not infected, the red band does not appear. The results are ready in just 10-15 minutes and reading of the test results is simple and easily understood by farmers,” says Dr Djibo. By providing farmers with rapid and accurate results, the diagnostic is effectively handing back control to the smallholder farmers whose quality of life has been affected by this disease and is a clear example of the importance of GALVmed’s focus and its partners’ work. In the rural villages of central Uganda’s Mukono and Mityana districts and eastern Uganda’s Iganga district, thanks to the introduction of the Newcastle Disease vaccine (I-2 ND) which protects poultry against this deadly disease, women have been taking on more roles in their households and communities. Through the income they get from selling their chickens at market, small, informal women-led business enterprises are popping up around the region. By selling their increased flocks of chicken at local village markets or to buyers who come for them at their homes, they have created a surplus in their income, which provides the business capital to start small informal businesses. These businesses are helping women diversify their livelihoods, contributing to their households’ income in times of distress. Among these women, there are several who are excelling in poultry husbandry and their healthy, growing flocks are admired in their communities. Since 2014 when the I-2 ND vaccine was introduced in Uganda, they have been keenly vaccinating their chickens; and their flocks have flourished and multiplied in numbers. As a result, they are being sought by other groups of women in their villages, to train them on proper chicken rearing and vaccinate for them. When Janet Mailuba from Buwolomena Village in Nabaale Sub County of Central Uganda began vaccinating her five chickens against Newcastle disease in 2013, her only aim was their survival. This 41-year-old mother of ten never imagined standing confidently in front of small groups of women in her village to train them on basic chicken rearing techniques and explain the importance of vaccination. By following the recommended ND vaccination cycle, every three months, and adopting improved chicken rearing, Mailuba now has 30 chickens and two goats and she is one of Brentec Vaccines Limited’s model farmers in her village. During the holidays she sells off mature chickens when the demand and prices are high and earns up to UGX 25,000 (US $6.97) per chicken. Brentec, through a partnership with the non-profit organisation Global Alliance for Livestock Veterinary Medicines (GALVmed), manufactures and distributes the I-2 ND vaccine locally known as Kukustar, to poultry farmers like Mailuba in rural Ugandan villages. Through GALVmed’s partnership over 25 million I-2 ND vaccine doses have been delivered to poultry farmers. According to Dr Mamta Dhawan, GALVmed’s gender focal point, it’s important that poultry vaccinations are inclusive of male and female poultry keepers. “When we talk of farmers, the general mindset is that they are men, but women are also farmers and shouldn’t be left out,” said Dr Dhawan. The goal of GALVmed’s gender policy is to ensure that GALVmed-supported projects take into account gender perspectives to maximise impact on the livelihoods of smallholder farmers in developing countries. With the vaccine protecting her chickens against the disease, Mailuba has a new source of income. Every time she sells one chicken, she earns between UGX 20,000 and UGX 25,000 (US $5.57-6.96). From the income, Mailuba is sharing the household expense burdens with her brick-layer husband by buying soap, food, medicine, uniforms and books for their children. “My husband now respects me and we live in harmony,” says Mailuba. She has also partnered with four women to form a welfare group for diversifying their livelihoods means, and every week they each save UGX 6,000 (US $1.67) in the group’s kitty. The group has also obtained goats after bartering some of their chicken at the local market – each goat is bartered for seven mature chickens. Mailuba now has two goats and is planning to buy a Friesian cow, so that she can improve her household nutrition and income through milk consumption and sales respectively. As a result of her being a Brentec model poultry farmer, three women groups in her village have been inviting Mailuba to train them on chicken rearing and vaccination. Susan Nandiyi from Nambale Village in Iganga district is also a model poultry farmer whose increased income from poultry has provided the opportunity for her take up more household responsibilities. The mother of ten in her late thirties has 30 chickens, but before she began vaccinating two years ago, she had at most five birds at a time. Almost all of Nandiyi’s chickens would succumb to Newcastle Disease and the burden of providing to her family was left to her husband. Today, through improved income from selling chickens, she pays for school fees for their children and buys medicine and food for the family when her husband is unable to or when their crops fail. 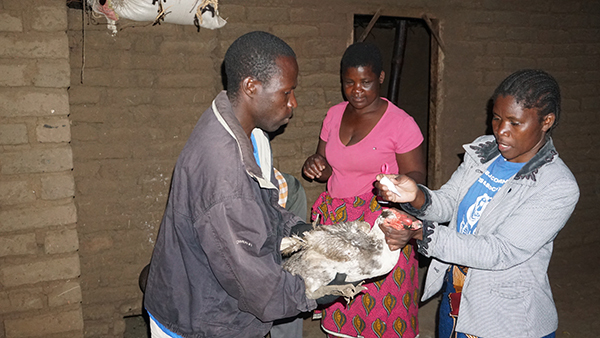 “When I see a need in the household I sell one chicken to buy what’s required,” said Nandiyi. Her contribution has added to the wellbeing of the family. She is also happy she can regularly slaughter a chicken for her family at least once a month, without costing her much. This gives her family much needed protein. Like Mailuba, she plans to buy a cow and goats with her savings from selling the chickens. 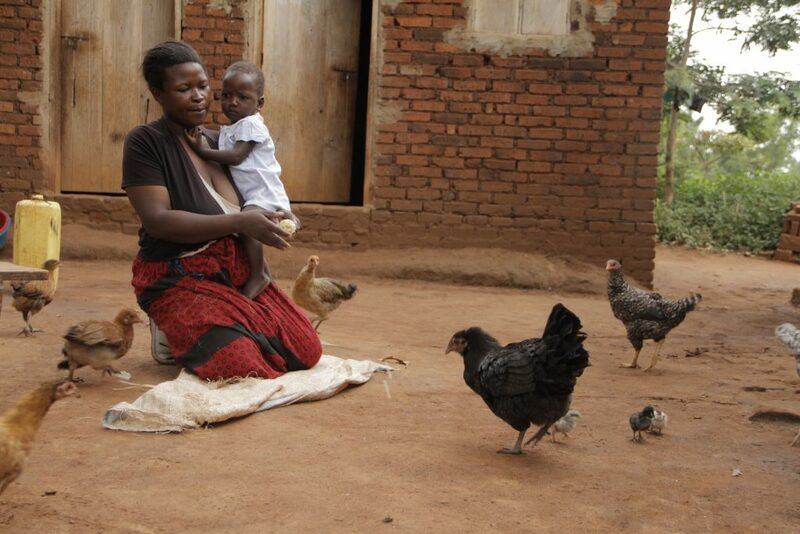 Nandiyi also encourages women in her village to vaccinate their chickens, having witnessed the benefits first hand. She and other women in her village have also secured consistent chicken buyers so they don’t struggle to market them. 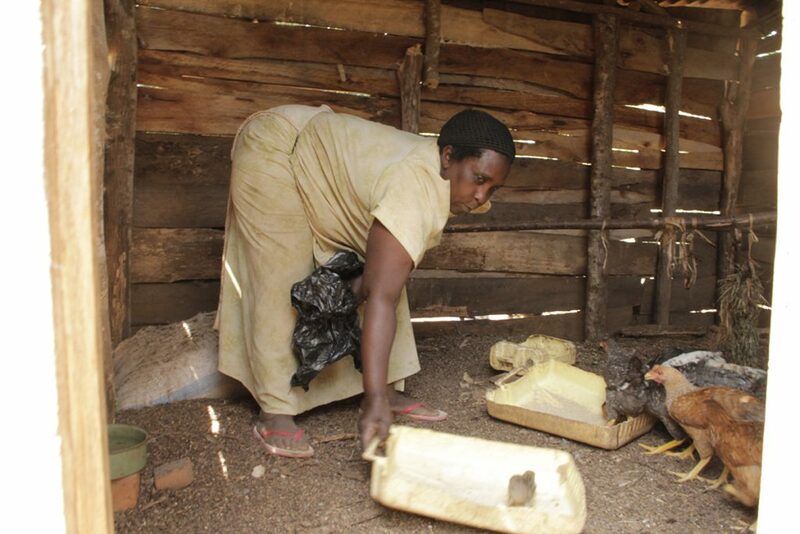 For 36-year-old Harriet Mutesi also from Nambale, the income she gets selling chickens now ensures that her husband includes her in household decision making. “It makes me proud to sit down with him and plan,” said Mutesi. 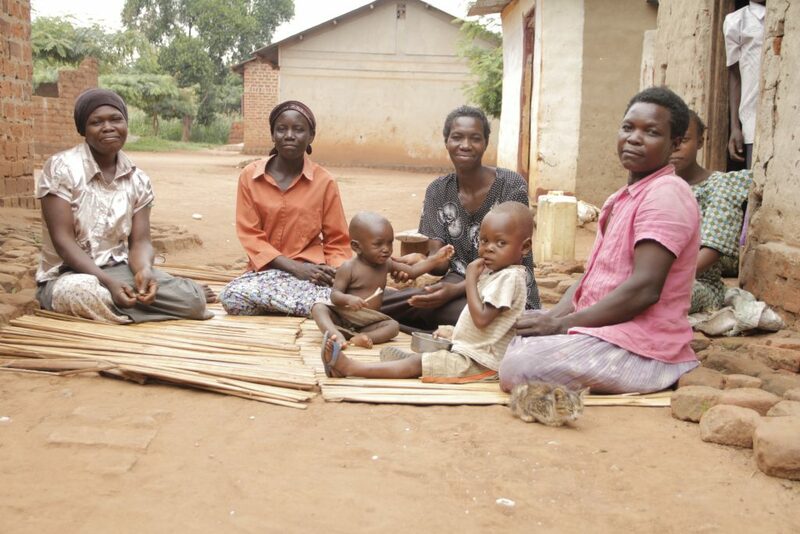 The mother of five buys pens and uniforms for her children and her husband buys books and pays school fees. “I used to feel bad when I couldn’t contribute anything to my children’s education, but now I’m happy,” said Mutesi. Between her and her husband they also decide every school term whose turn it is to pay the fees. Having been a tailor all her life, 71-year-old Magdalene Muyango from Ngulolo village in Mityana district, decided to rear chickens two years ago to supplement her income. The mother of eight almost quit when she once lost 15 out of her 25 birds in a single week. Through a radio advertisement she learned of the Kukustar vaccine and had her chickens vaccinated first a year agoand every three months since then, by local para-veterinary professionals. Since vaccinating, Muyango has not lost any chicken to Newcastle disease; currently she has 20 growing chickens. These provide her with eggs for home consumption and selling. The secondary income she gets from the chickens she saves in a local saving group called Mayirye Development Group. The 40 member welfare group consists of both men and women. “Every week I save UGX 5,000 (US $1.39) and the chickens have really helped me to be getting that money,” said Muyango. The extra income she gets from the chickens has also helped relieve her husband from the burden of providing basic household needs. “I’m happy to see him rested,” said Muyango. During the implementation of projects, GALVmed ensures its community engagement activities are structured so as to be convenient for women attending according to Dr Dhawan. That means meetings are not scheduled during lunch time or late in the evening when women are busy attending to their households. Gender discrimination has been found to be a cause of poverty and interventions aimed at poverty reduction need to be gender sensitive, according to GALVmed’s Gender Policy.